Mike Roberge attacks down the sideline. 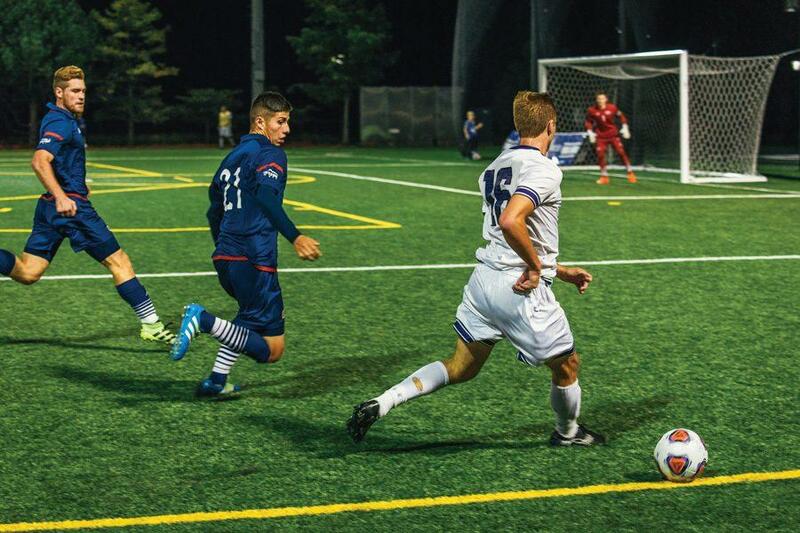 The senior forward will lead the way for Northwestern’s attack as the Wildcats attempt to upset No. 8 Indiana in the Big Ten Tournament. Northwestern’s next game could be its last. On Sunday, the Wildcats (6-10-1, 3-4-1 Big Ten) will travel to Bloomington to face No. 8 Indiana (10-1-6, 3-0-5) in the quarterfinals of the Big Ten Tournament. The game will not be an easy task, but NU has risen to the occasion before, playing the Hoosiers to a 0-0 draw back in September. In that game, Indiana dominated play, taking 28 shots to the Cats’ three. But NU’s defense held up under duress, allowing only six shots on goal. The Hoosiers are coming into Sunday’s game on a two-game winning streak in which they outscored their opponents 7-1. The two-game winning streak is a part of a larger unbeaten streak, as Indiana hasn’t lost a game since Oct. 4, when it lost to Notre Dame 4-0. But NU has showed good form in the past weeks as well, going 4-1-0 in its past five games, including a 2-1 overtime victory over the then-No. 4 Fighting Irish. Much of the Cats’ recent success has stemmed from their new formation, which features three center backs on NU’s defensive line. The Cats’ tactical change has also given life to its attack, leading to an increase in scoring. On the season, NU has scored 15 goals, but seven of them have come in the past five games. Despite the offensive surge, the Cats know that the name of the game on Sunday will be defense. Indiana has scored 26 goals on the season and averages over 1.5 goals per game. Facing one of the top teams in the country, NU realizes that its chances to score will be scarce. “We’ll get maybe one or two chances, and we’ll have to capitalize on them,” senior defender Nathan Dearth said. For the seniors on the team, Sunday is an ultimatum of sorts. Win and survive, or lose and face the fact that their college soccer careers are done.